Represented by the hard-working goat with a mermaid's tail, Capricorn is a loyal, ambitious yet unforgiving sign. Stable, practical and domineering, a full moon in this sign encourages us to pursue our goals relentlessly to completion. Now is the time to charge ahead and get things done! When creating this altar, I wanted it to be simple and straight-forward. No need to over-complicate what needs to be done. The symbolism is fairly obvious and precisely organized without being crowded, just how Capricorn would like it. Front and center on this altar is a goat horn, for all the obvious reasons. An earth sign, Capricorn is represented by the mer-goat. Including goat symbolism was essential to this altar. Behind the goat's horn sits an obsidian sphere. Obsidian is associated with Capricorn's ruling planet, Saturn, and lends itself to the strength and stability of this sign. Working our way straight back in a line, we find a pine cone shaped candle. Anything involving trees encourages the element of earth. Pine specifically is also associated with Saturn, again enforcing the ruling planet of the sign at hand. Finally, at the back of the altar, we come to the main candle. The brown of the tall candle calls to the earth element that is Capricorn. It is stable, practical and goal-driven. The base of the candle is padded with moss. Moss is associated with water, which links back to the fish tail of the mer-goat sign. 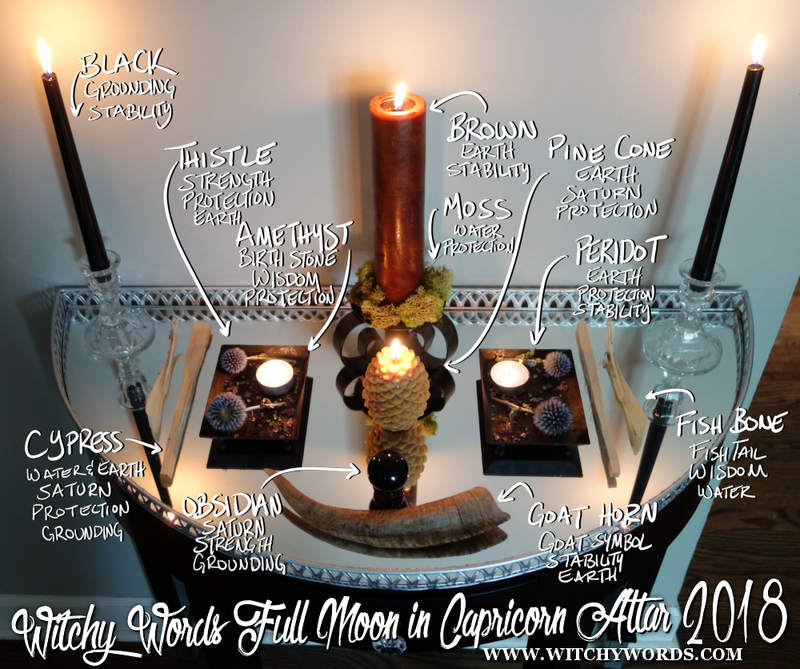 Offering plates on either side of the altar contain various items associated with Capricorn. Thistle is a an earthy herb associated with strength and protection. Two adorn each plate. Amethyst and peridot shards are also sprinkled as offerings. Amethyst is the birthstone for Capricorn and beckons wisdom and protection, while peridot symbolizes the earth and stability. Additionally, each plate contains a candle lit to empower the offerings. On the outer side of each offering plate sit two more simple yet important items. The first is a piece of cypress wood. Cypress is associated with both earth and water, elements strongly associated together for this sign. The wood's ruling planet is Saturn, same as Capricorn, and enforces grounding and protection. To the outside of that is a fish bone. Fish are said to represent wisdom and water. This again links back to the fish tail of the mer-goat. Finally, a black taper candle adorns the outer-most corners of the altar. Black is a grounding and stable color, similar to Capricorn's practical, earthy ways. Overall, this altar was a testament to exactly what Capricorn is: A mer-goat symbol fusing earth with water, a stable, practical sign ruled by the planet Saturn that seeks completion and order ruthlessly. I'll leave you with a visual description of the altar. Enjoy! I adore your use of the amethyst/peridot shards! Your altar is very well-thought out, thank you for sharing. Thank you so much, Rose! I appreciate your kind words!